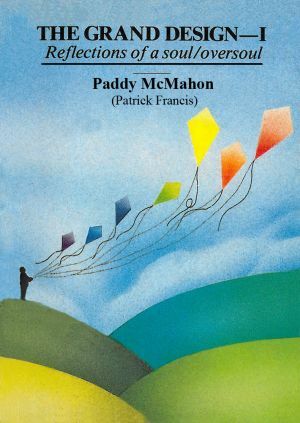 In the Introduction to the first volume Shebaka informs Paddy McMahon. "I am no stuffy higher being - I just happen to be in a higher vibration - nor do I want to set myself up as a know-all nor as an object of veneration nor as a symbol of sanctity. I only tell you about the higher vibration to reassure you and anybody else who might have access to these words that I speak with some authority having progressed through many stages of evolutionary growth. I will be talking about these stages later but if you want to think of them in terms of seven stages such as are already familiar to you then I come at present from the sixth stage. I am also in a position to describe the seventh stage." Excerpts from the book "The Grand Design — I". There has been much written, much spoken and a lot of fighting over the notion of freedom. The right to freedom is usually regarded as a basic human right. But what is meant by freedom? Freedom in the real sense can never be a matter of nationalistic achievement or the right to self-government or to own property or to practise religion or to marry or to divorce or to vote or to act as you would wish to act at any given time. Those things constitute a physical licence within an always limited framework. Real freedom, however, is totally unlimited. It is a spiritual thing - which does not mean that all spirits, even those without physical bodies, are free. A spirit being with a physical body can achieve freedom as well as a spirit being without a physical body; the way to freedom for both is through their thoughts. Ideally, then, a person should not limit himself by his thinking or, to put that in a positive way, he should free his thinking from all constrains. There are obvious constraints such as bigotry, hatred, bitterness, intolerance, anger, self-righteousness, fanaticism, despair, envy, but there are other less obvious ones such as piety, prudishness, holiness, self-denial, self-glorification, duty, guilt, impatience, anxiety, worry, fear, authoritarianism, desire to be loved, to be popular, to be wealthy, to be famous, to possess or to be possesses, to achieve power or position, to impose a code of behaviour or a particular viewpoint, to conform, to be seen as conventional, to be seen as respectable and respected, to uphold tradition, to be sexually attractive, to be sexually potent, to be recognised as a success, to be appreciated, to be praised, to be shown gratitude for favours done, to repay or be repaid debts, to punish, to harbour grievances, to seek happiness in people, places or things, to escape from a particular situation, to have job satisfaction, to have sexual satisfaction, to be able to buy better clothes or food or a more expensive house or car. It may not be an exhaustive list but it's an exhausting one! What I've been trying to show is that not only the obvious things but also what might be regarded as normal wishes and urges are all in their own way constraints on freedom, the real freedom of thought, and by their very existence in thought form they present a barrier which blocks off the receptiveness of the mind to other thoughts. So what good is freedom, then, if it means giving up so much of what is normally regarded as pleasurable? Freedom doesn't mean giving up anything. It means being free of the pressure of anything and everything. It doesn't mean giving up the experiences of living. It means looking at them from a different prospective. It means giving rein to the unfettered joy of being, knowing that to be is everything. A spirit, part of God, does not need anything; it already has everything. It is free if it will but realise its freedom. The process of realisation is the often painful journey that all must travel. It is unfortunate that pain is involved but that it is the nature of spirit that all must ultimately be free is the supreme consolation. Part of the purpose of these sessions is to help to take the pain out of the journey towards realisation and to make it an enjoyable trip instead.